The Whitefish Trail Operations Committee is requesting quotations from interested contractors for trailhead construction during the spring of 2017. The new trailhead will be located adjacent to the City of Whitefish water treatment plant on Reservoir Road. Specifications and guidelines are linked below and hard copies are available at City of Whitefish Parks and Recreation Department. Interested contractors will be required to attend a mandatory walk-through on Thursday, April 6, at 9:30am. Quotations will be due by 4:00pm on Friday, April 21, with work slated to begin as soon as possible thereafter. Trailhead construction must be completed no later than June 30. 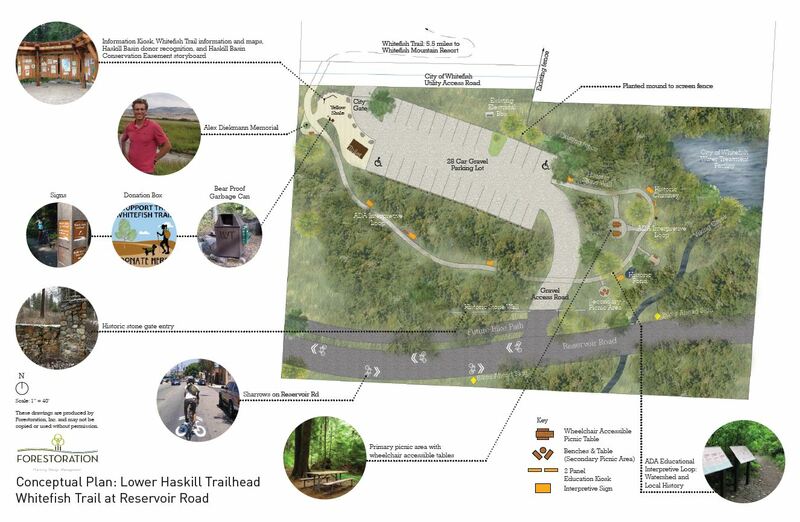 Bids should be submitted to the Whitefish Parks & Recreation Department referencing Whitefish Trail Lower Haskill Trailhead Construction. For questions, please contact Whitefish Legacy Partners, 406-862-3880 or Greg Gunderson, 406-261-8407, greg@forestoration.com.